Today with the Sun aspecting both Neptune and Saturn, you may feel like certain areas of your life are in a state of limbo. 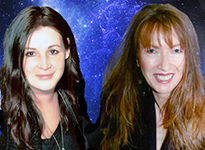 Plans you’ve made may be put on hold, or you may feel the need to take a step back and regroup. The Hanged man refers to things slowing down or even coming to a dead halt. It could be due to circumstances beyond your control, or it could be a decision you make when you realize the path you’re on is leading you in a direction you don’t want to go. You could be frustrated over something that’s taken too long to manifest, or have the sense that nothing is happening despite your best efforts. Road blocks are put in your path — often for your own good. The Sun / Neptune inconjunct can make you feel like your life force is being drained right out of you, and the semi-square to Saturn brings obstacles and obstructions. With these aspects in play today you may feel like you’re being blocked at every turn. In this version of the card, we see a shirtless Native American figure strung up under the glaring heat of the Sun. He’s gaunt and skeletal, and at first glance appears to be dead. But we can see one fist clenched in what could be defiance. You may have been running at a break-neck pace, never stopping to look at what you’ve accomplished. Or you may have found yourself losing steam over a project that just hasn’t panned out. Either way, it may be time to put things on hold — at least long enough to evaluate your commitment. The Hanged Man often refers to delays and sacrifices. When it does, you can bet they’re necessary. Trust that there’s a reason — even if it’s not readily apparent — and that it will reveal itself to you in time. 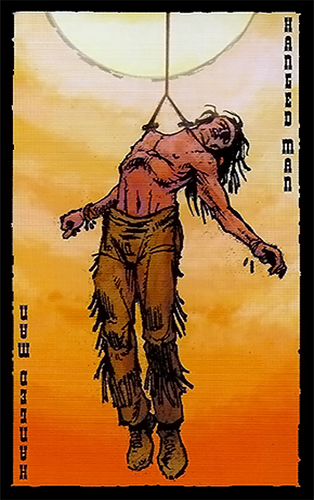 The card used for today’s tarotscope — The Hanged Man — is part of the Prairie Tarot series, designed and illustrated by the phenomenal artist Robin Ator.